I have this validation on Delivery Date/Time column. I need admin/site owner needs to edit the list no matter what the delivery date/time is. Please let me know how can I achieve this?? This should, in theory, work. Sorry if it looks a bit daunting but what it's supposed to do is copy the event handler for both save buttons (in the ribbon and on the page body) and replace the "onclick" event with your custom function which in this case I called isUserAllowed. Or you know... just the validation you've got already.But since you're looking at a query on permission levels all that logic gets put into the "success" function in the ctx.executeQueryAsync() below.... If you need more help send me a message. I don't currently have my SharePoint environment to test further. // Client context for the web. // Find the permission value in question. // Execure the query. On success, return if the user's permission is >= query. // Here's where you find the date field you're interested in. // to determin the right value. // as a boolean value. Call "originalSaveButtonClickHandler()"
// to notify the user if their field is incorrect. // content has been loaded. Not the answer you're looking for? 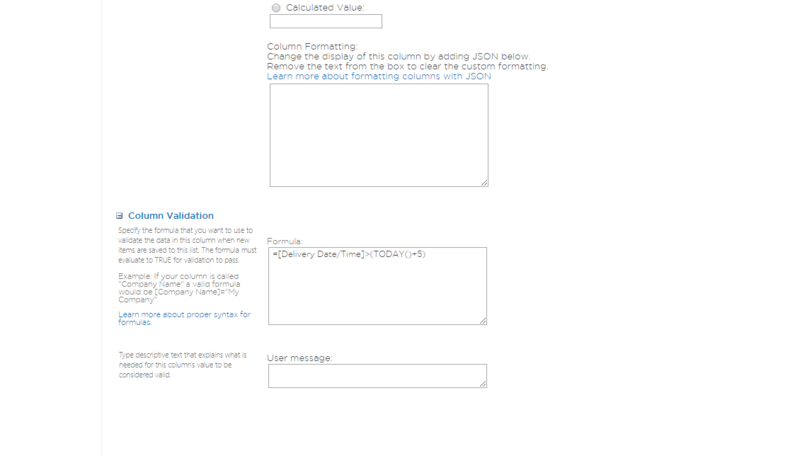 Browse other questions tagged sharepoint-online date-time column-validation or ask your own question. How Do I Input Todays Date Into a List?